Queen duvet cover (88" x 88") featuring the image "In Deep Water" by John Lautermilch. Our soft microfiber duvet covers are hand sewn and include a hidden zipper for easy washing and assembly. Your selected image is printed on the top surface with a soft white surface underneath. All duvet covers are machine washable with cold water and a mild detergent. Beautiful expression John! Love the color composition, wonderful execution!!! Congrats on your sale! A wonderful composition. The colors are spectacular. Congratulations ! 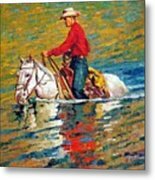 Congratulations on your sales...this is such a wonderful painting...the water, reflections, and colors make this so vibrant. Beautiful. This is a real eye-catching image....simple yet bold. 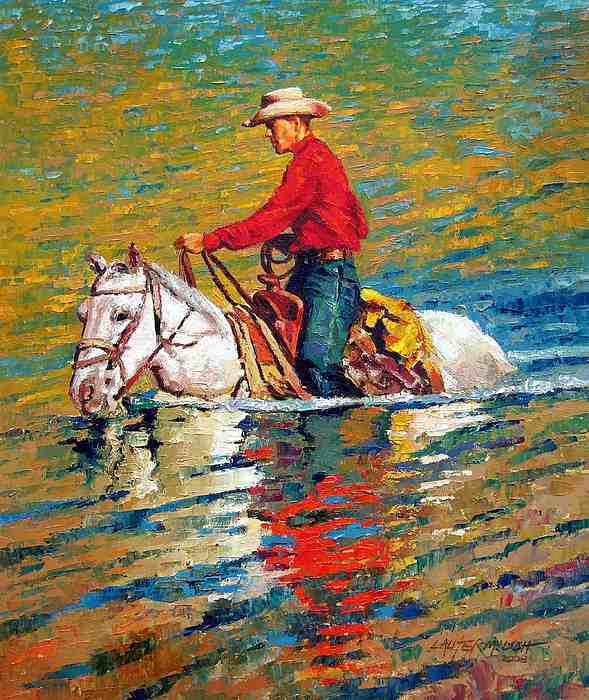 A really beautiful and dramatic painting. 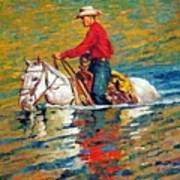 Love those bright colors and the brushwork. Love the colors you've thrown into this.. just makes it come to life for me. And, this is a little different for you.. interesting.. 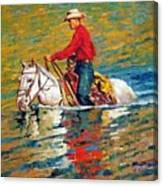 In Deep Water - original oil painting on stretched canvas of cowboy crossing a river is sold.